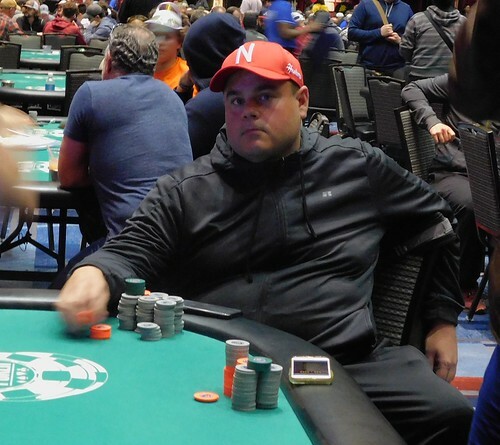 Welcome to Day 1B of the Main Event at Harrah's Cherokee. Yesterday, Day 1A drew 417 entries. When the day ended, 50 remained, led by Mike Vanier (pictured above) with 773,000. Today, another group of players will try to challenge that mark. Flight 1A begins on Friday, April 19th at 11 a.m.
Players will begin with 30,000 in tournament chips. Players will have a 15-minute break after levels 3, 6, 12, and 15. There will be a one-hour dinner break after level 9. Registration will be open until the start on level 13. Players are allowed one re-entry per flight for a total of four entries total. Day 1 will play through 17 levels. Players will return with the survivors of Flight 1B on Sunday, April 21st at 12 p.m. The winner of this event will receiver a WSOPC Gold Ring as well as a seat in the Global Casino Championship.